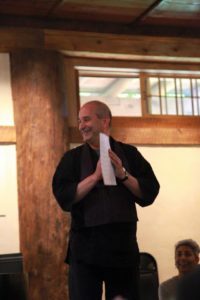 Sensei Joshin is a Zen priest and teacher in the White Plum lineage of Maezumi Roshi and Bernie Glassman Roshi and is a dharma successor of Roshi Joan Halifax at Upaya Zen Center. He served at Upaya as the president and vice abbot until founding Bread Loaf Mountain Zen Community. Joshin founded Bread Loaf Mountain Zen Community to create a hub of socially engaged Zen practice of contemplation and action born of the Zen Peacemaker practice of Bearing Witness. Professionally, Joshin has spent much of his career working for social change nonprofits in the areas of AIDS and HIV prevention, child welfare, and community based philanthropy. He is currently the director of Upaya’s Chaplaincy Training Program and serves as a core faculty member, focusing on systems thinking and systems leadership. Joshin is partnered with Bernie Schlager, and together they have three children and many grandchildren, which are a great joy.